This post was written by Maliheh Bitaraf and Sheryl Steadman. Maliheh Bitaraf is a graduate student at the Seton Hall School of Diplomacy and International Relations. Maliheh got her first Master’s degree in Mass Communication at Middle Tennessee State University (MTSU). Maliheh is a media associate at the Journal of Diplomacy and a UN Digital Representative at the Center for UN and Global Governance Studies. Maliheh specializes in International Organizations and Foreign Policy Analysis. Sheryl Steadman is a graduate student in the School of Diplomacy and International Relations at Seton Hall University. Sheryl also has a Master’s in Public Administration and a Certificate in UN Studies, both from Seton Hall University. Sheryl is an Associate Editor at the Journal of Diplomacy and a UN Digital Representative at the Center for UN and Global Governance Studies. Sheryl specializes in International Organizations and International Law. On September 28, 2018, undergraduate and graduate students alike at the School of Diplomacy were privileged to hear Rajaa Altialli deliver a talk on “Women Mediators and Civil Society Peacebuilding in Syria”. 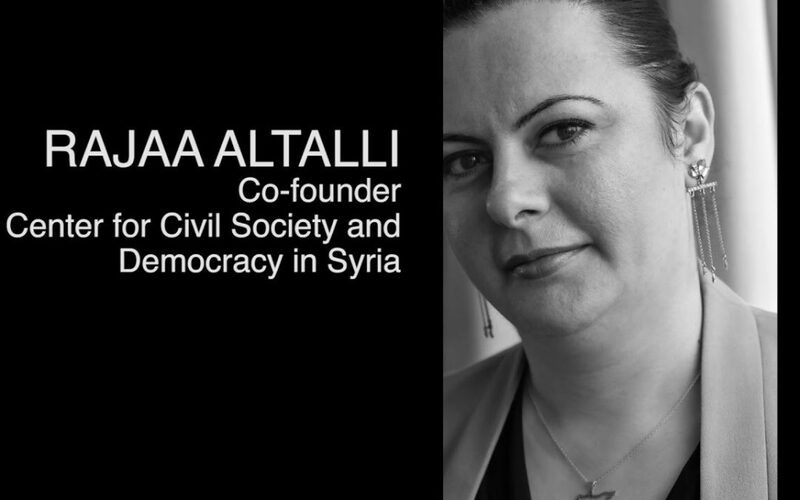 Rajaa is the Co-Founder and Co-Director at the Center for Society and Civil Democracy (CCSD), a non-profit organization that supports and trains Syrian civil society, especially women, to move Syria into the direction of a peaceful democracy. Rajaa’s story is one of resilience and perseverance as she continues to promote gender equality and women in the peacebuilding process inside of war-torn Syria. She shared the story of her father being jailed as a political prisoner and the effect that his absence had on her and the family. She said that her father’s imprisonment moved her in the direction of never wanting to be in politics, but in 2011 when the Syrian revolution began, she was obliged to become an activist because what was happening around her was far too great to ignore. Rajaa began her political activism in the United States and Geneva while completing her masters and doctoral studies. She believes that the power to impact change means ensuring that she is linking different people together on the ground to keep the movement going, and essentially, this is what CCSD does at the grassroots level. She talked extensively about the efforts to get women more involved in the process of bringing the Syrian conflict to an end. Rajaa acknowledged that many Syrian women activists are looking to the women activists of Iran for guidance and input because Iranian women have been successful in creating a blueprint for the advancement of women’s rights in their own country. Although the Syrian civil society groups have played a role in changing the dynamic in Syria and the peace process; the essential change needs to come from the Syrian women and making sure that it is more of their voices at the table. The Civil Society Support Room (CSSR), which is viewed as a new approach to the UN peace and mediation processes. Its objective is holding meetings for civil society on the sidelines to promote peace talks. It is important to note, that it was the first time in history that the formation of these types of mechanisms resulted in more active engagement of civil society and of women in the political peace process. Recognizing the UN Security Council’s Resolution 1325 (adopted in 2015) on inclusion of women in peace-building processes, Rajaa discussed that women are still deliberately omitted from the active political conversations in the peace talks. She also argued that despite some progress made in Syrian civil societies in the current peace talks, they are still very politically divided. The debates over the government’s Constitution is a hot button issue and keeps the division of political interests at the forefront. In conclusion, Rajaa stated that the Syrian people would not be able to achieve peace if they do not have justice – this specifically brought her attention to the detainees, who are mostly political activists. She reiterated the importance of the role played by women and their attempts to achieve peace. She continues to encourage more unity between the civil society and women as well as their active participation in the intra-Syrian peace talks, because she believes that the more assertive they are in demanding to be included and heard, the more difficulty it is for the Syrian government to continue to exclude them from decision-making process.